No Peeping Tom here, if that's what you were thinking. I'm just a wildlife photographer trying to earn a living. 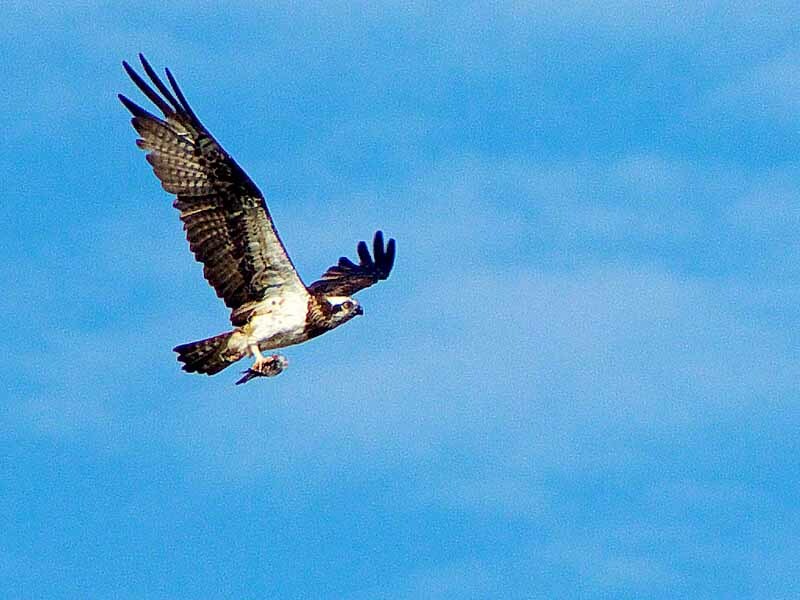 It was a nice sunny day and the Ospreys were catching fish. 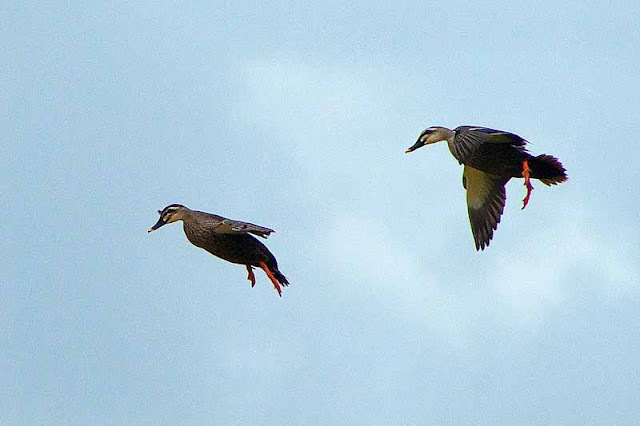 I got a few great shots of them flying above the pines on a hill with humongous fish in their talons with my little Pentax 18-250mm lens stretched out as far as it would reach. 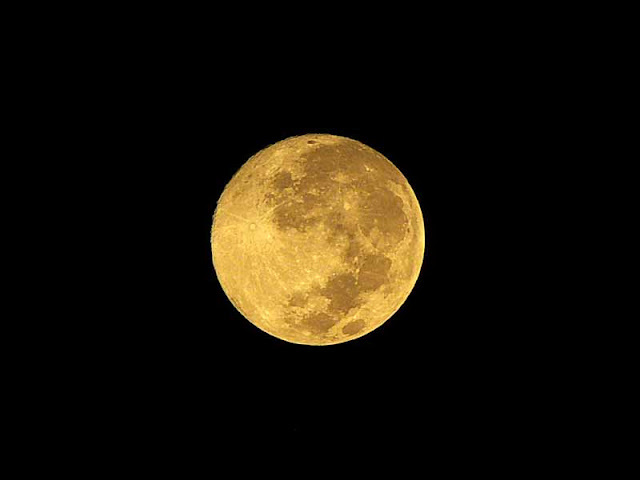 That's when I decided to use the Sigma 50-500mm lens and a tripod. And never saw a bird with a fish again, the rest of the day. But, along came these honeymooners and their guide, paddling sea kayaks. Shoot first, ask questions later. That's what I do. Meet Mr and Mrs Tsuyoshi from Hokkaido, Japan, led by their kayak sensei Masaki Takezawa. I'll be featuring the honeymooners on my homepage the next few days because they were nice folks and I promised them, when they returned to Hokkaido, they'd be on my front page to show friends and family. They signed a release form for me, granting me consent to do whatever I want (within the limits of the law) with their photos. So, everybody got their pictures emailed to them and if they tell me which they like best, they'll get a full-sized file suitable for printing. That's what I do. Now, Masaki, he's a local guy and my new friend. I'll probably drop by his kayak shack and deliver a framed photo to him whether he likes it or not. That's another, "That's what I do". See, there really isn't much money to be made, hiding in the bushes like a Peeping Tom, trying to shoot Ospreys flying around with fish in their paws. If it's an art, then I'm a starving artist. But, it sure would be cool if I could hide in the bushes and watch for honeymooners, paddling sea kayaks and shoot first and have somebody else (Masaki Takezawa) ASK THE QUESTIONS LATER ! See the Bride and Groom kayak by themsevles HERE. Before all my friends in uniform start sending hate mail, this is just a joke, OK? I'm just funnin' with you so, lighten-up. I learned a long time ago, there's nothing wrong with a good laugh, especially when you can laugh at yourself once in awhile. "SARGE SAYS THEY'RE ALL OUTA CHOCOLATE DONUTS AND WANTS TO KNOW IF WE WANT CINNAMON INSTEAD". 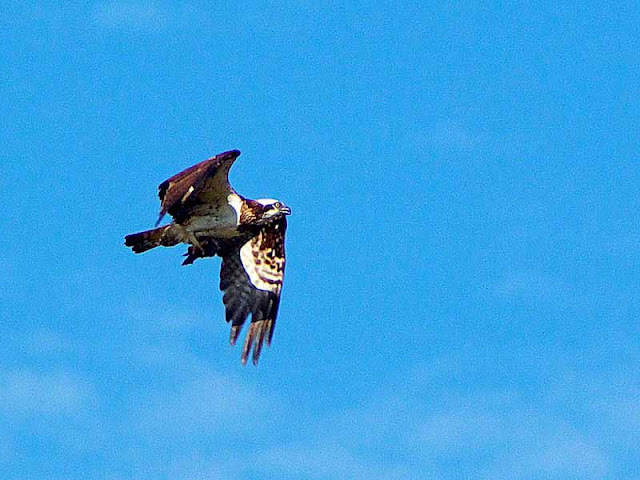 Today, an Osprey taking his fresh fish home got the attention of my Pentax. Here are a series of three shots I snapped while panning the camera handheld using my 250mm lens. Once they dive into the water and come up with a fish, they turn the fish so it is facing with its head forward. The Osprey takes its dinner away from where it was caught, usually to some tall pines uphill from the water. More Okinawa Wildlife photos may be seen in my website GALLERY. 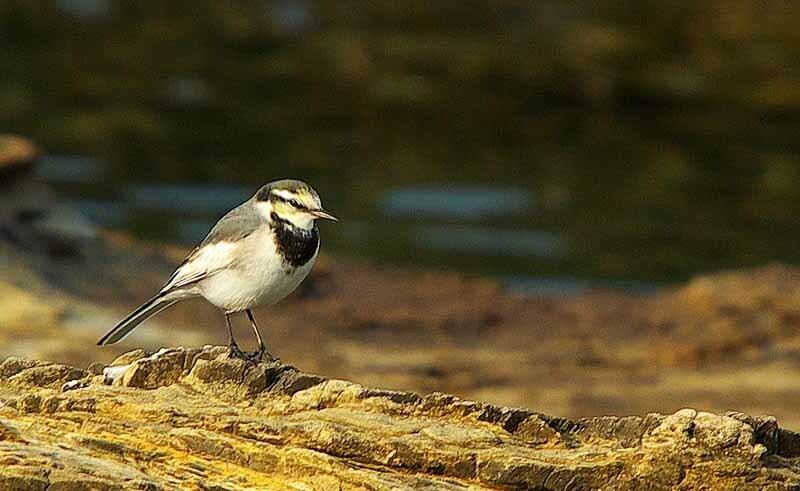 A Winter visitor to Okinawa, Japan this bird is found marshes and along the seacoast in shallow waters. It usually eats anything small enough to swallow with one quick gulp. 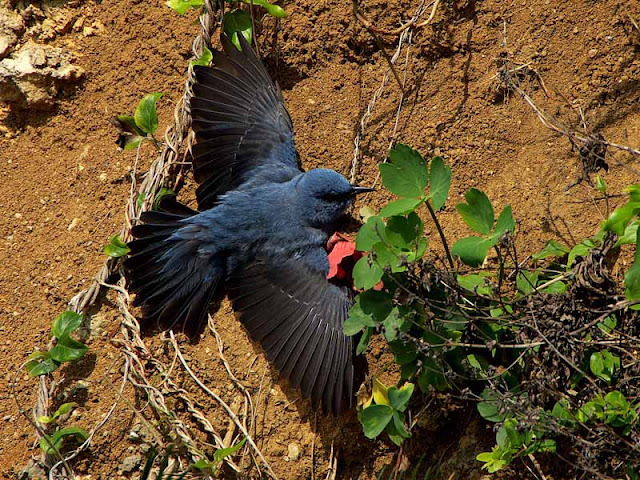 That may include fish, shellfish, spiders, bugs, mice and, ocassionally, other small birds captured in flight. 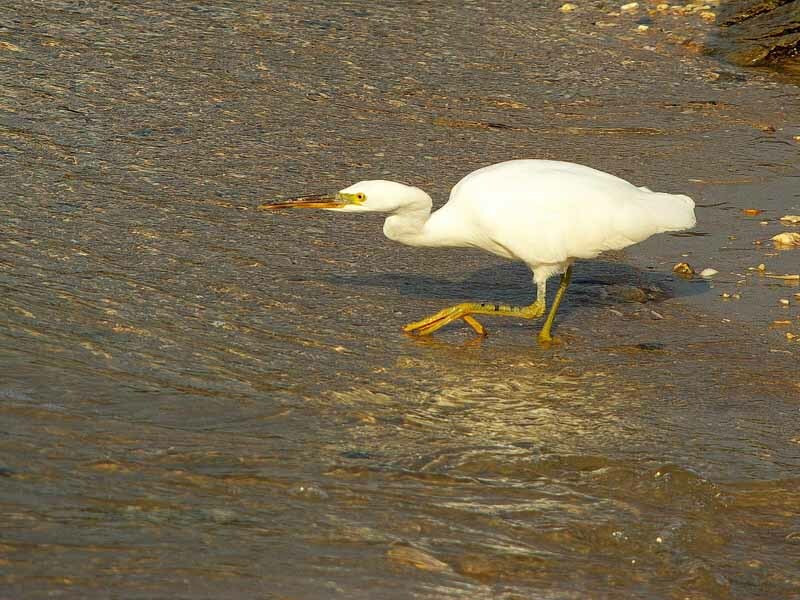 More Egrets, Herons, Eagles, Hawks and smaller birds may be seen on the Gallery pages of my WEBSITE. 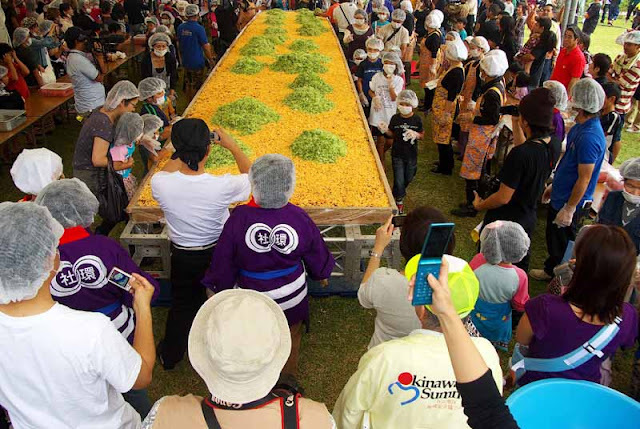 The Photo above was taken at an exotic event called the Shinugu Matsuri, a religious ceremony conducted only once every two years in the northern mountains of Okinawa, Japan. Only men are allowed to witness the rituals conducted in the mountains. The women do their things later. 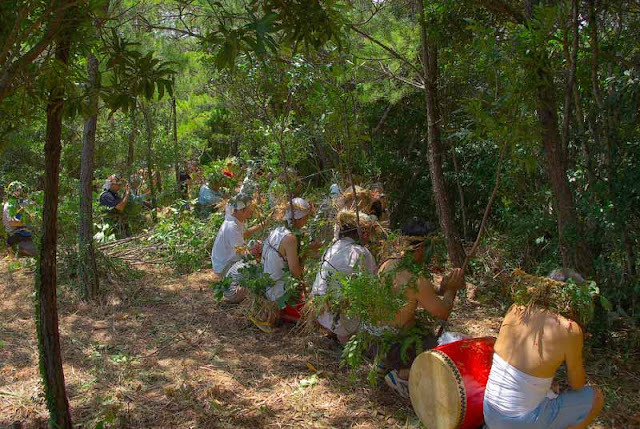 More about these men praying in the mountains may be seen in my Article THE SHINUGU MATSURI IN OKINAWA. 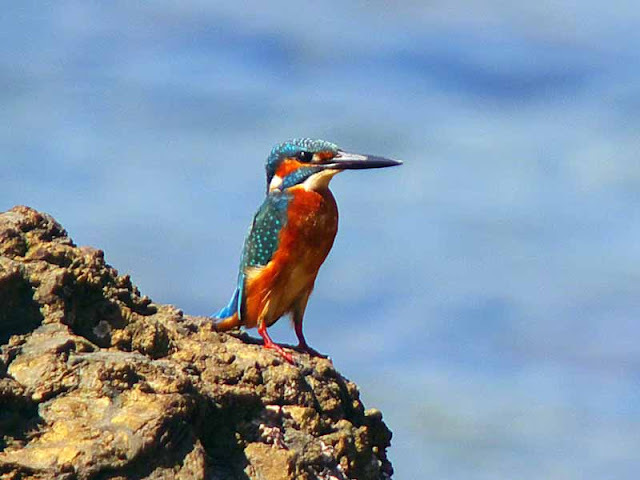 The Common or European Kingfisher (Alcedo atthis) may be found near river banks and shorelines. 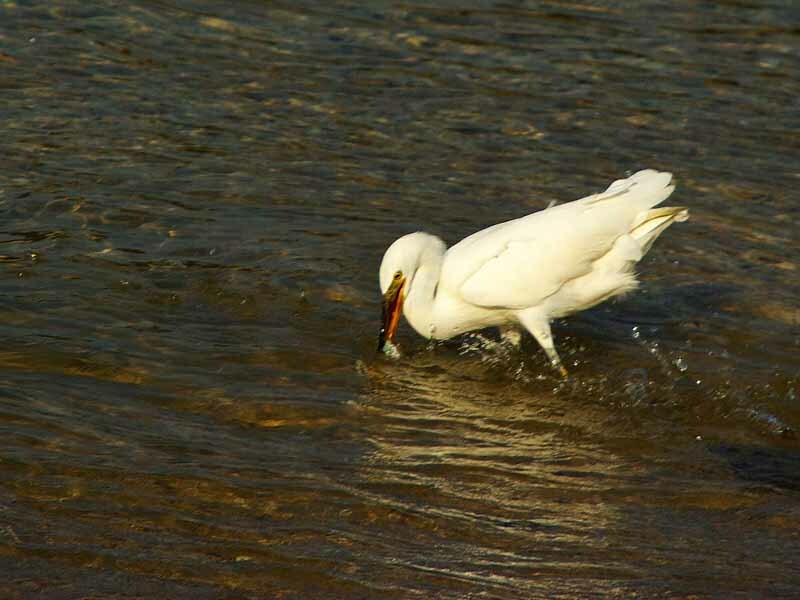 They hunt for their prey in relatively shallow waters, consuming close to 60% of their bodyweight in small fish, daily. 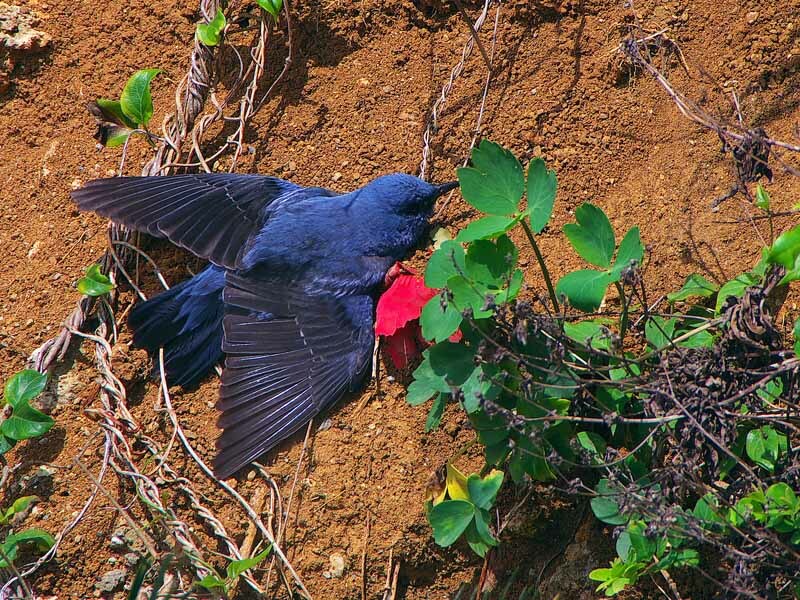 More Wildlife Photography from Okinawa, Japan may be seen HERE. 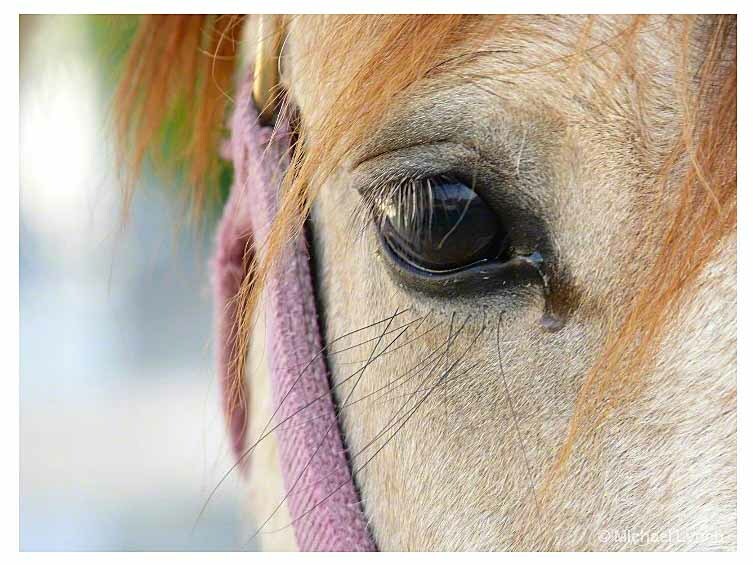 Horse Meat: Ever Been So Hungry You Could Eat A Horse ? Yeah, I remember hearing "He eats like a horse", "I'm so hungry I could eat a horse" and "He has the stomach of a horse", meaning "He can eat almost anything." So, I had this picture of a horse laying around collecting digital dust, decided to post it here and did my research. Guess what I found out today? Lots of people eat horses! What I learned by consulting my good friends over on the WIKIPEDIA CHANNEL is over 700,000 tons of horse meat was produced in 2005 and they whacked over four million horses worldwide to provide enough horse meat to ship out to the countries where horses are eaten. Have you ever been so hungry that you could eat a horse? 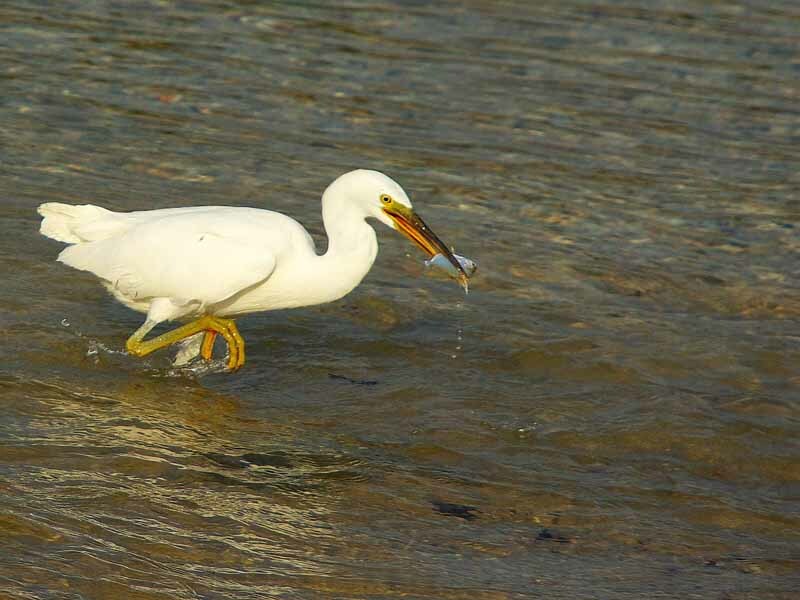 Here are a dozen photos with short captions to demonstrate how a Pacific Reef Egret catches a Tiger Fish and prepares it for breakfast. The entire process lasted two minutes. Red Beach Okinawa, Japan NOV 11, 2010 8:35AM the bird lands and takes a look around. He's hungry. 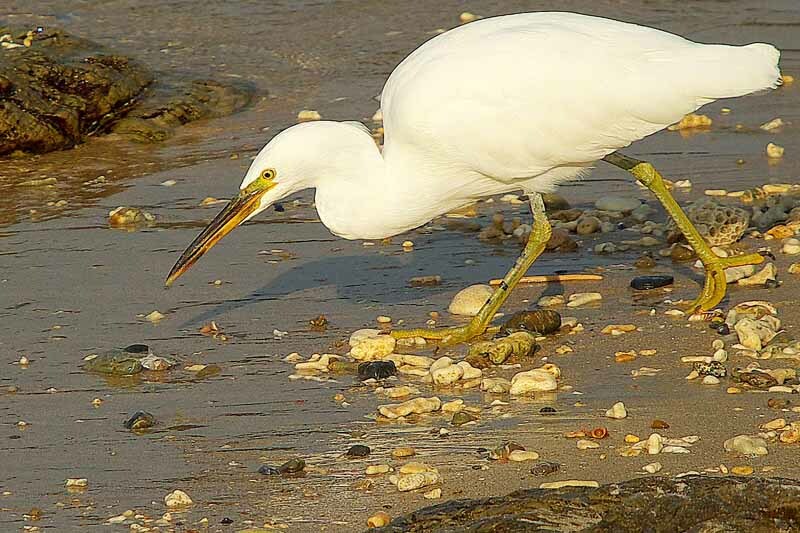 He spots a meal heading his way as the tide comes in and gets down in the bird-stealth mode. At precisely the right moment he reaches out and grabs the little guy. It's a Tiger Fish. 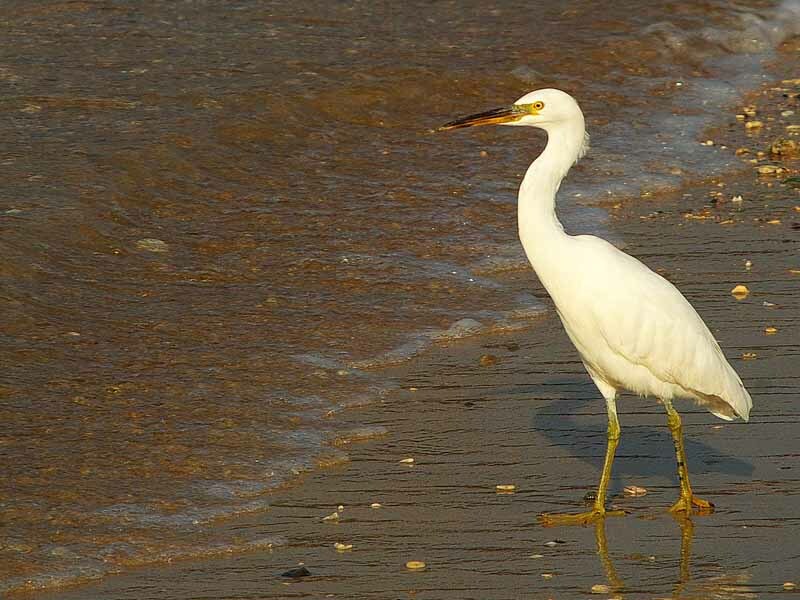 Next, he turns around and wades back towards the shore. 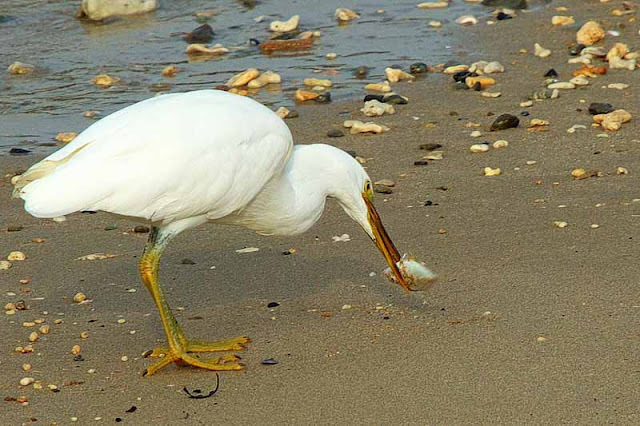 This way, if he drops the fish, it'll be a lot harder for the critter to swim away. 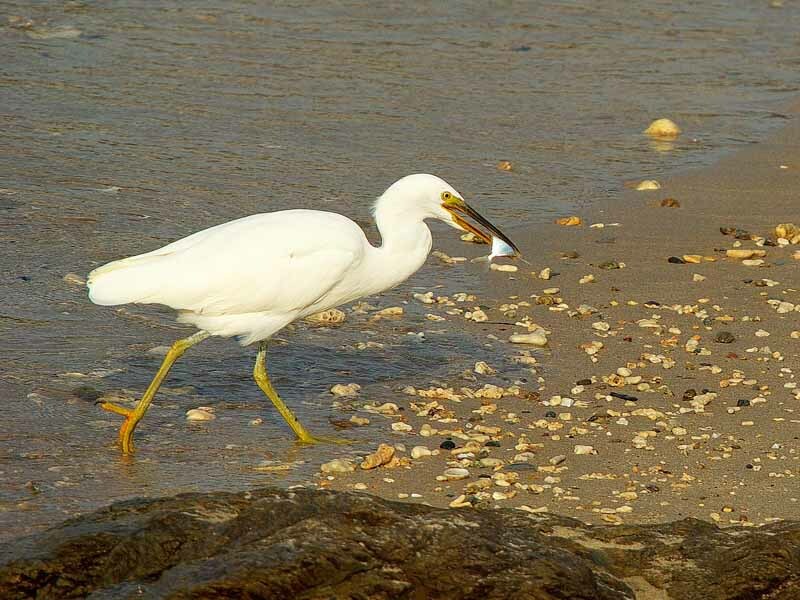 Now, these Egrets don't have any teeth to chew with so, they have to figure out a way to get the fish in the right position to make them slide down the hatch without choking themselves. 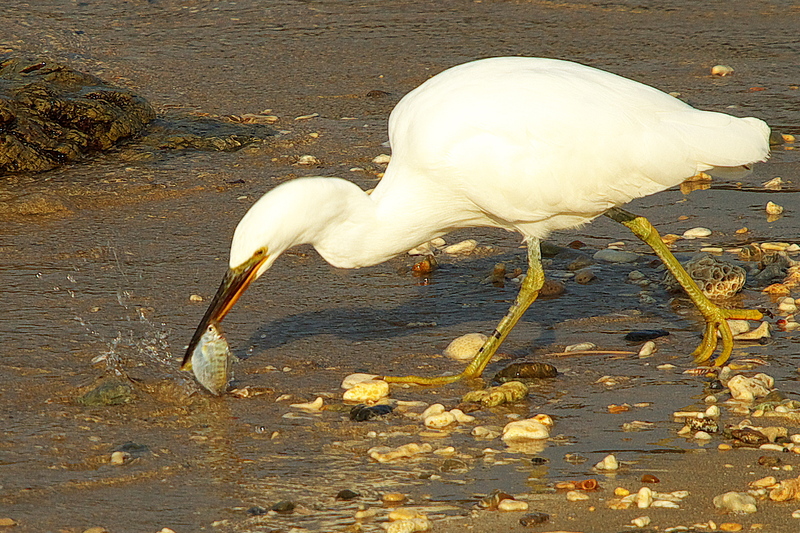 The Tiger Fish sorta figures out what's going on and decides he won't cooperate with the bird trying to eat him. 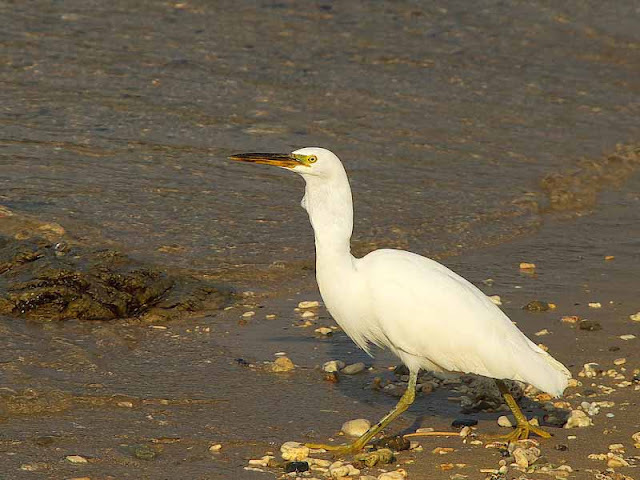 The Egret gets an idea. Just put the Tiger Fish down and keep an eye on him. They're a lot easier to swallow when they aren't throwing a tantrum. When it looks like he's had enough quiet-time the bird grabs the Tiger Fish again. It's Round #2. 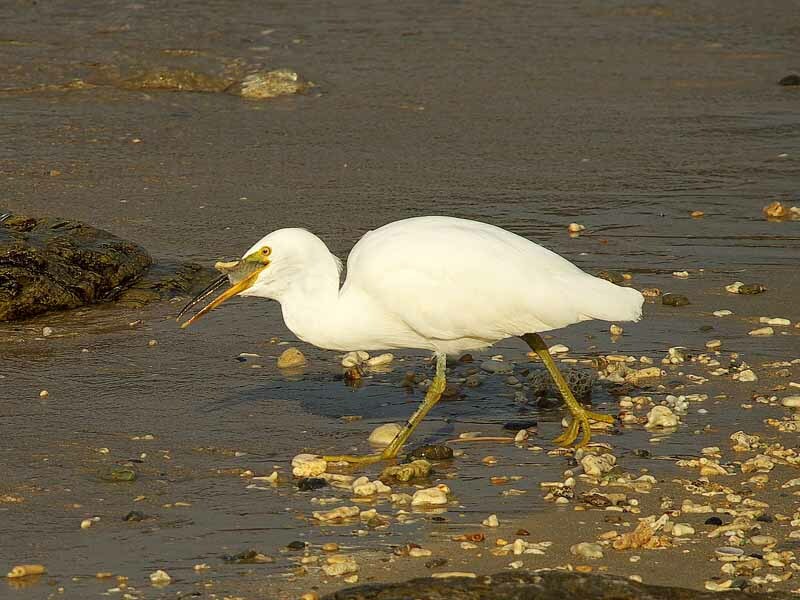 .....and, with one big gulp (8:37AM) the Egret, Tiger Fish and the Two Minute Breakfast story is over ! 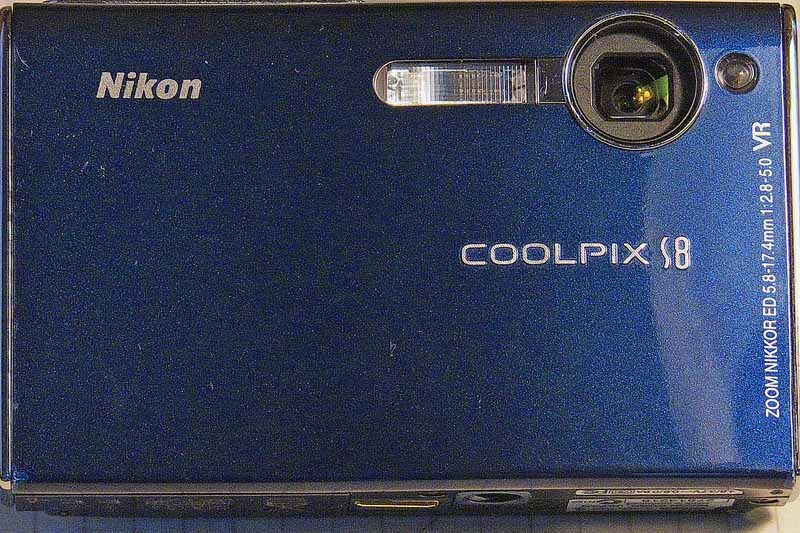 Buying a Digital Camera can be confusing these days. With hundreds of makes and models and pixel counts that number from two, to more than I can count on my fingers and toes. When people ask me for advice on which brand or model to buy the first thing I want to know is what kind of shooting they want to do. Today, I decided to put together this Top Five List of resources to help my friends shopping for a camera, or maybe, those making lists to mail Santa Claus. Here you go "Learn How to Buy a Digital Camera". Only you can decide which is the best camera for you, your wallet and your pocket size. 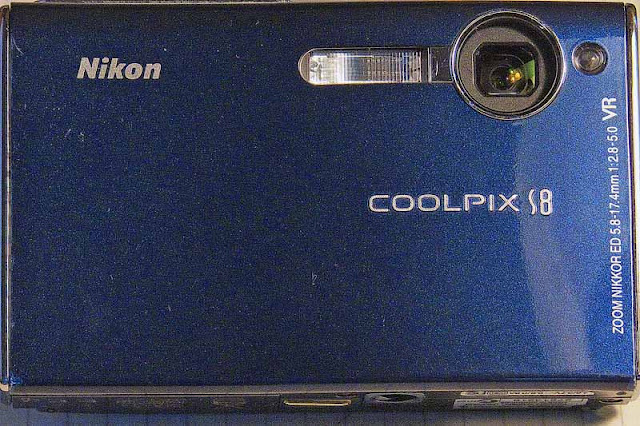 The Nikon in the photo above I borrowed from my sister-in-law just to take a photo of it. But, when I saw how easy it slid into a shirt pocket, decided I kinda like it. I really don't endorse any one brand over another. Just make sure after you've read through my Top Five List and Learn How to Buy a Digital Camera before you buy, you visit a camera shop and physically handle the camera (even before ordering online) so you know you'll be happy with that particular model. That's to keep me from having to do a Photography Tip on "How to mail the camera you don't like to Ryukyu Mike"! 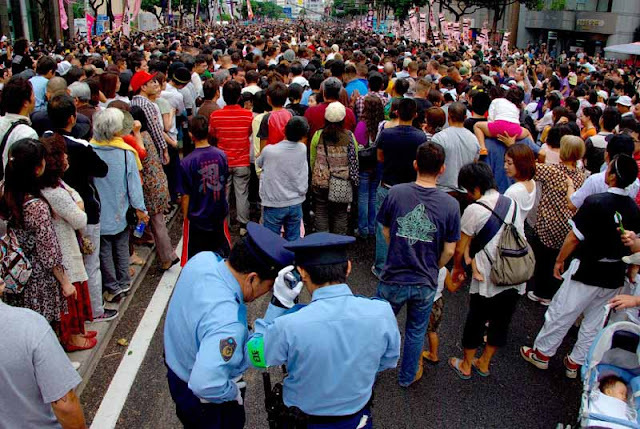 Weapons were banned in Okinawa by the Japanese after what was known as the Satsuma Invasion in 1609. The Ryukyu Islanders developed unique ways of defending themselves against Samuri warriors armed with spears or swords. Farm implements, common tools and even jewelry became martial arts weapons. 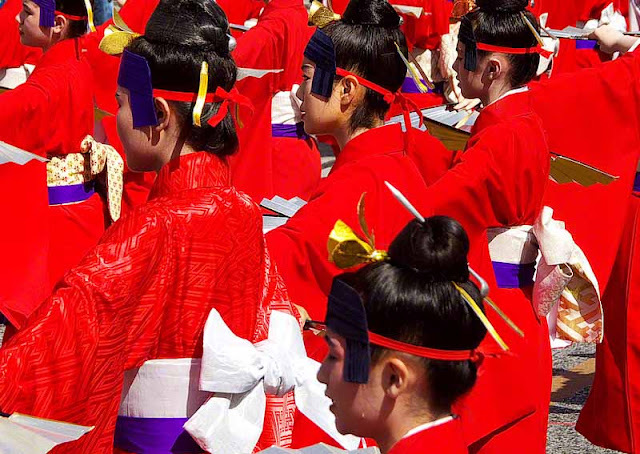 Have a closer look at the Kimomo clad women performing in the annual Coronation Ceremony for the King and Queen of the Ryukyu Islands. 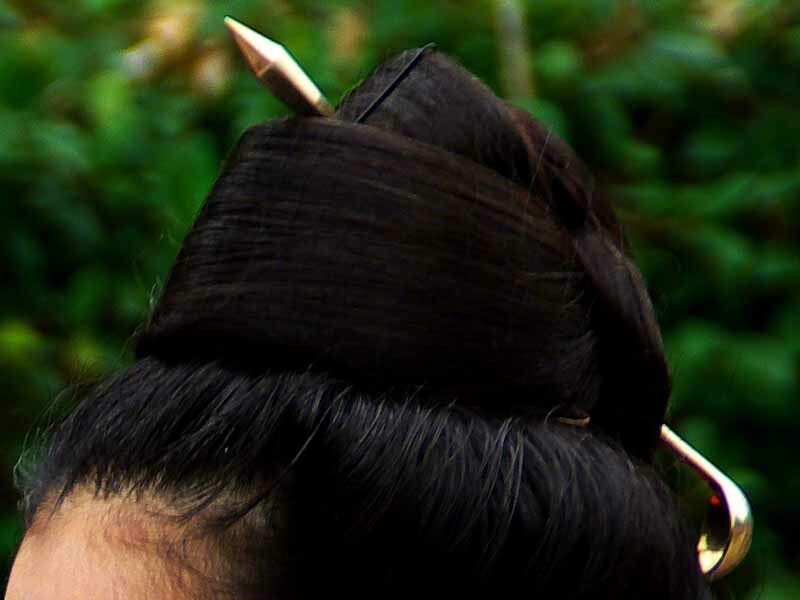 Their hairpins are called "Jifa". They are girls with weapons in their hair. 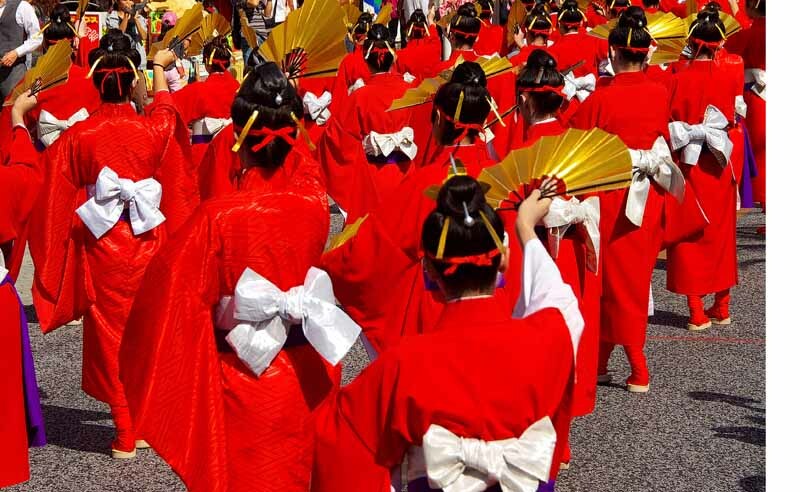 From a distance, waving their fans and dancing with graceful, fluid motions while taking tiny steps in their full length kimonos, they may appear quite dainty to an evil-doer lurking in the shadows. Zoom-in and have a closer look at the topknot of the girl in the lower righthand side of this photo. The Jifa is much more than a hairpin or piece of jewelry. It is a deadly weapon. In their dance lessons, they learn much more than how to step and fix their hair. They also learn martial arts. Mr. Stalker best stay in the shadows. An even closer look at the Queen's hairdo, as she's leaving the castle, shows she has a gold jifa as her hairpin. Now that I'm safe at home and out of the shadows I'm wondering "What other places besides Okinawa, Japan can you find girls with weapons in their hair"? 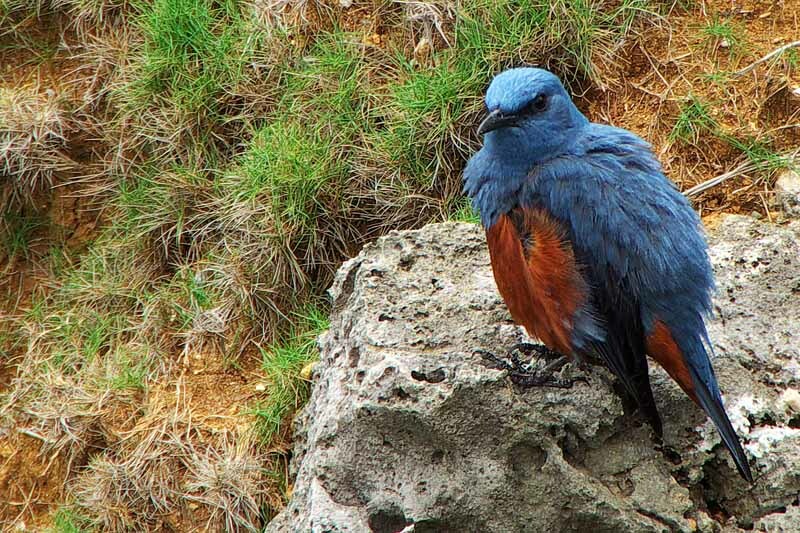 For more photos on the Culture, Festivals and Wildlife of Okinawa VISIT MY PHOTO GALLERY. Taiko Drums are Japanese instruments that are as much a part of the culture of Japan as sushi, rice and chopsticks. 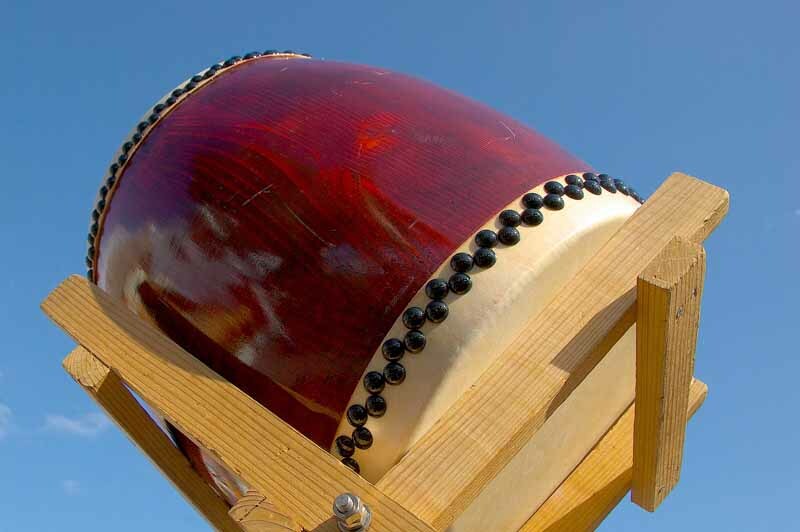 These musical instruments may be heard at just about any Festival throughout Japan, in Concert Halls, at School Grounds, Sporting Events, on TV, CD, DVDs or the Radio. But, there's nothing like seeing and hearing a live Taiko Performance. If you haven't witnessed a live Taiko Performance and felt the earth vibrate under your feet, I'd have to say "YOU HAVEN'T SEEN OR EXPERIENCED JAPAN" ! 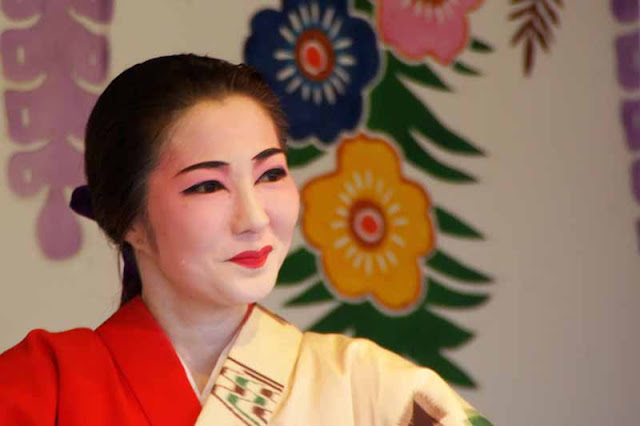 See more of the Culture, Festivals, Lifestyle and Wildlife of Japan in my WEBSITE GALLERY. Landscapes, seascapes, cityscapes and sunsets lend themselves to the use of wide-angle lenses. As a wildlife photographer, usually I’m zooming in to reach out and touch something far away. But, there are times you want to be able to do both zoom and shoot wide angle and you want to be able to do it without stuffing a camera bag full of different size lenses. It can be done. This photo was shot at the Dragonboat Races, an annual event in Nago Okinawa, Japan. My intent, here was to capture the crowd, sky and clouds and the three dragonboats finishing the race, all in one wide-angle shot. A scene composed like this draws the viewer’s eye into the picture with what are called “leading lines”. The mountains in the background divide the photo roughly in half, separating the sea from sky. The position of the boats leads the eyes towards the white building, as does the angle of the crowd along the port. 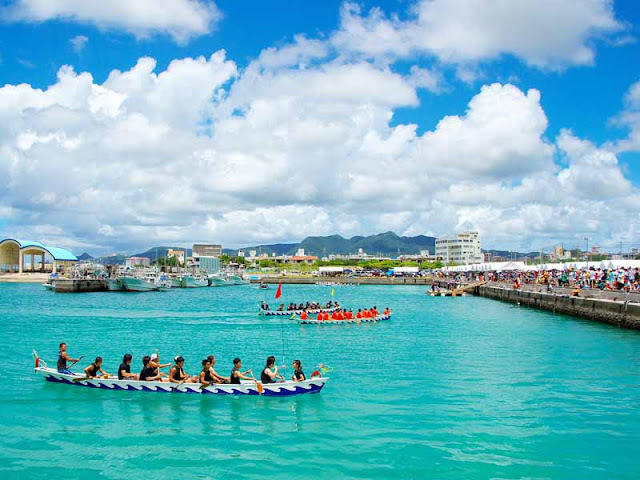 Billed as the largest dragonboat event on island, I was sort of disappointed when I saw the size of the boats, as the dragonboats in the Naha races are much longer than these are. In fact, they hold a crew of 30 people. Arriving at 7AM, 2 hours before the start, gave me plenty of time to scout out a good position for my camera and tripod. A few shots (Close ups where I used the zoom) of some dignitaries and pretty girls, with the blue skies and clouds as background, earned me an Official Staff armband and police protection, so I could shoot from anywhere I desired. There’s a lot more involved in being a travel photographer than just pointing and shooting the camera. The lens that handled both jobs and kept me from having to switch lenses from wide-angle to zoom, for close-ups, was an 18-250mm. If you travel a lot and want one lens that does it all, it’s probably one of the best all-around lenses you can buy. You could go a whole year without ever having to swap lenses and worrying about getting dust on your sensor. 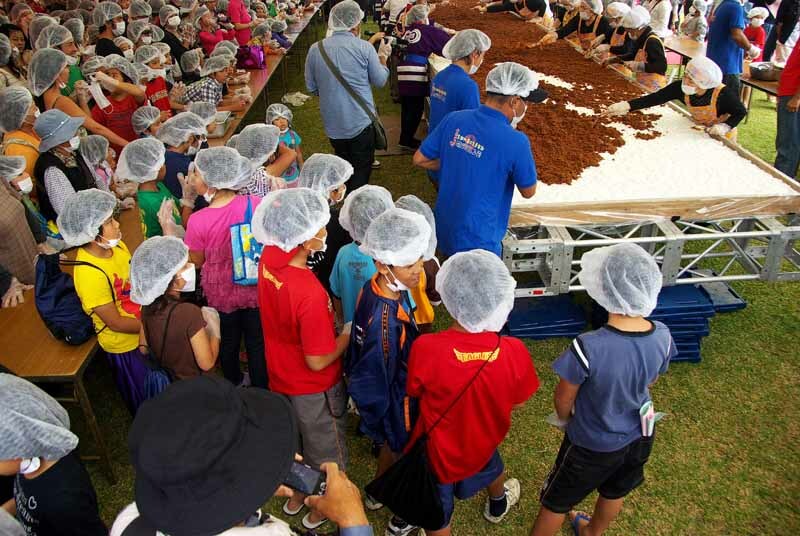 By the time the races started, over 500 white tents had been pitched at the port and 153 teams were involved, from all around the world; that explained the island’s “biggest dragonboat race”. I stayed for about half the event and had to go to the other end of the island to shoot another event. Monday, I emailed the dignitaries and pretty girls their photos, then deleted them from my hard-drive. Who needs photos of pretty girls, anyway? I’ve got a photo that makes you feel like you can walk right into it. Have you got a lens that will zoom or shoot wide angle in your bag of tricks? For a close up look at a Naha Dragonboat have a peek HERE. That boat got me my 100th Editor's Pick at Better Photo, yesterday! Airline security, foreign and domestic devils, full body scans, TSA folks wanting to probe private parts, John Tyner threatened with a fine, all this stuff got me thinking. I'm not so sure I even want to travel anymore. I thought about this for awhile. Now, I'm wondering what they would've charged John Tyner with if he just dropped his drawers and mooned the TSA. Hah, indecent exposure, I bet. That'd be a good one to take to the Supreme Court. Give them the Moon! 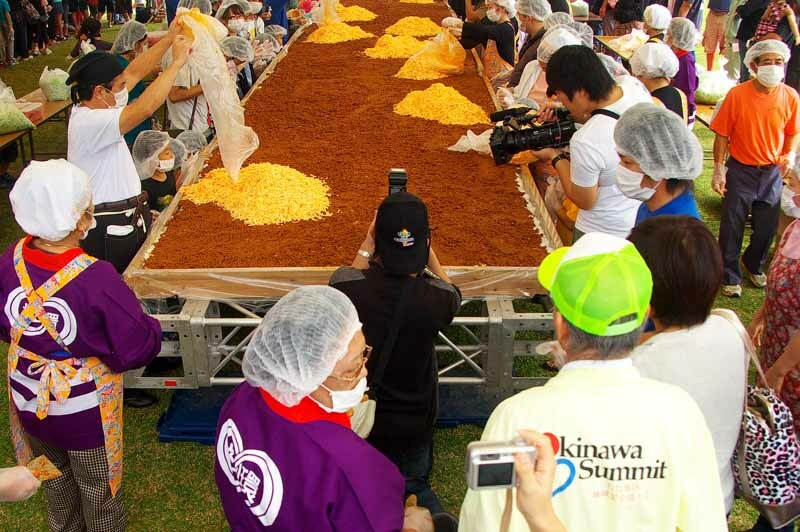 Making World Record Taco Rice is a community effort. You could do what I'm showing in photos on a much smaller scale. Cover your coffee table with plastic wrap and have some friends pitch-in for a Super Bowl Party, maybe. 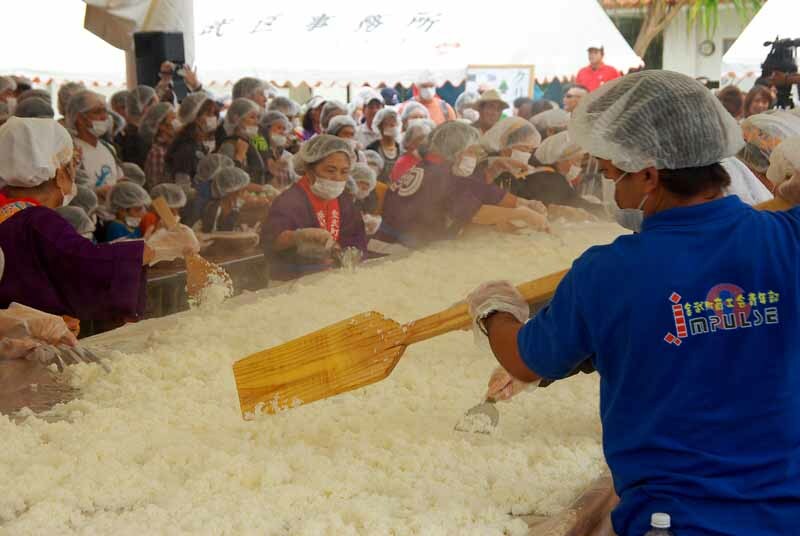 You won't break any Guinness Records but, you won't go hungry either! The exact measurements you won't get here for a couple of reasons. 1. 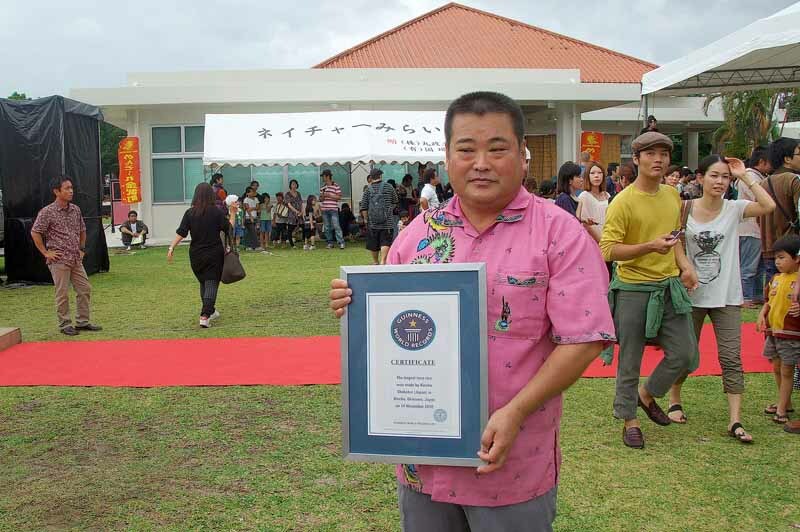 Somebody will try and break Kin Village's Guinness World Record, for sure. Even if ya waterboard me, I ain't talkin'. I live here. 2. My ears hear things about as well as a rock so, when the speakers blared out "Kilos" I thought they were talking about "Helos" like Mr. Guinness, or somebody was gonna land in a helicopter. This isn't exactly a Betty Crocker (She still around?) recipe; just estimate how many friends you have coming over and throw in as many kilos as you think it takes and maybe add a few more. Just look at my visual recipe and add the ingredients to suit your taste. Steamed rice is the first layer. You probably could get by using a putty knife instead of a paddle. Cover the rice with your favorite blend of meat and taco sauce. Trowel it over nice and smooth. Load the next layer up with shredded cheese. Kinda like lasanga but cheddar works best, I think. Pile on the shredded lettuce and spread it around to cover all the cheese. You could get away without wearing a mask if everyone promises not to sneeze. Hats and cameras are optional. Fresh tomato slices top the whole thing off. It's ready to eat. You could have the whole thing done before the Super Bowl Pre-Game finishes and enough left after the Super Bowl Party to feed the cleanup crew. 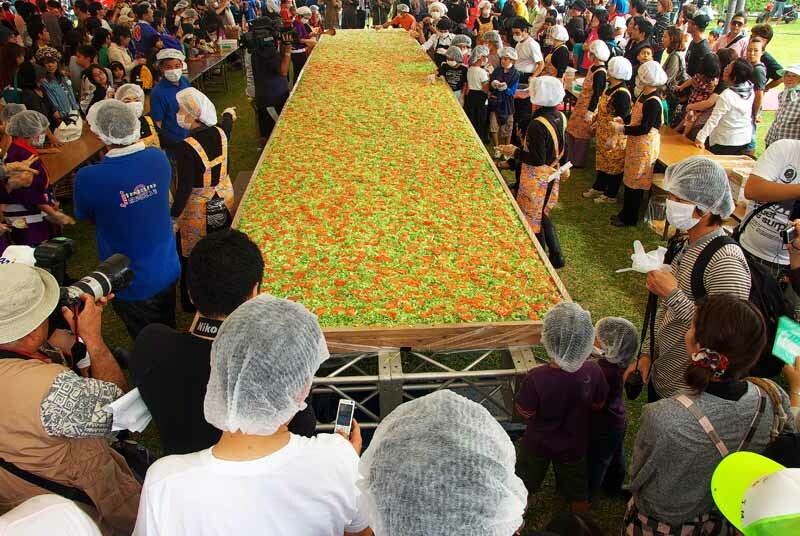 If you really want to try breaking the Guinness World Record for Taco Rice keep checking HERE and find out what it takes to be a winner. They'll even give you an application. Have fun ! NOTE: THIS POST WAS AN ENTRY FOR SHOW ME JAPAN A BLOG ALL JAPAN LOVERS SHOULD FOLLOW ! It's official. This is what the Guinness World Record Certificate looks like. Today I witnessed the whole event from start to finish. I will be awhile before I'm ready to present the complete story. But, I want to get this online today so everyone can see my hometown Kin Cho in Okinawa, Japan made the largest Taco Rice in the world ! You'll have to give the folks at Guinness a bit-o-time to get back home and post this because they come from the other end of earth where it's still Saturday. When the jetlag is over and it's Monday in the United Kingdom, maybe, you can verify my delicious record HERE. Laugh if you want to laugh and Dance if you want to dance, they're both good for your health. I'm not much of a dancer but I'm more into laughing because that's something you can do just about anywhere. Dancing, you have to get all cleaned up and go to one of the big cities, for that. And I'm not real fond of cities. That's me in the photo. Well, my face, anyhow. I'm not really that muscular and hairless so, I stuck my face in this cutout they had in a shopping mall and had my apprentice snap the shot. Some elderly women, sitting at an outdoors cafe, got a good chuckle out of my performance. This photo is the property of my right-hand cameraman Rusty Robertson and not to be copied, downloaded, printed, distributed or redistributed in any way, shape or form. Don't even try emailing it, screenshooting it or taking a copy off your monitor with your cellular phone camera. Just look at it a laugh, if you can. And, if you can't laugh, try dancing. Laughing and dancing are both GOOD FOR YOUR HEALTH ! 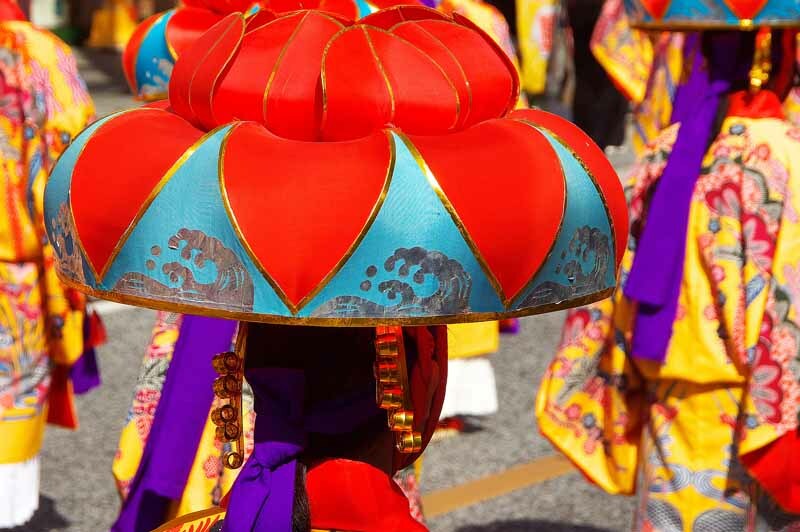 The Hanagasa is a brilliantly colored hat worn by women performing a dance called Yotsudake. The hat represents a large red flower, the blue symbolizes the sky, the silver waves, the ocean. More about traditional Okinawan attire may be seen here. 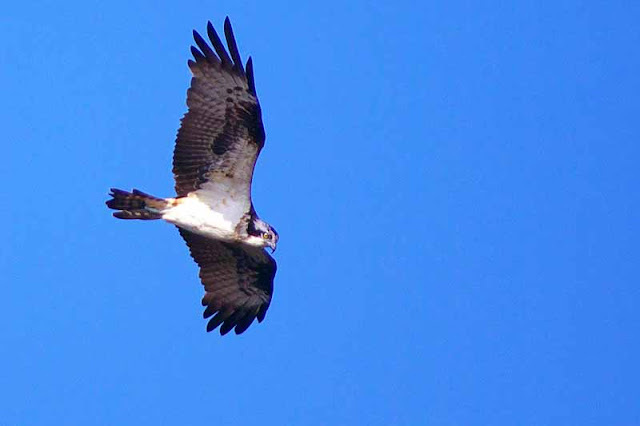 The Osprey (Pandion haliaetus) may be seen on every continent except Antarctica. 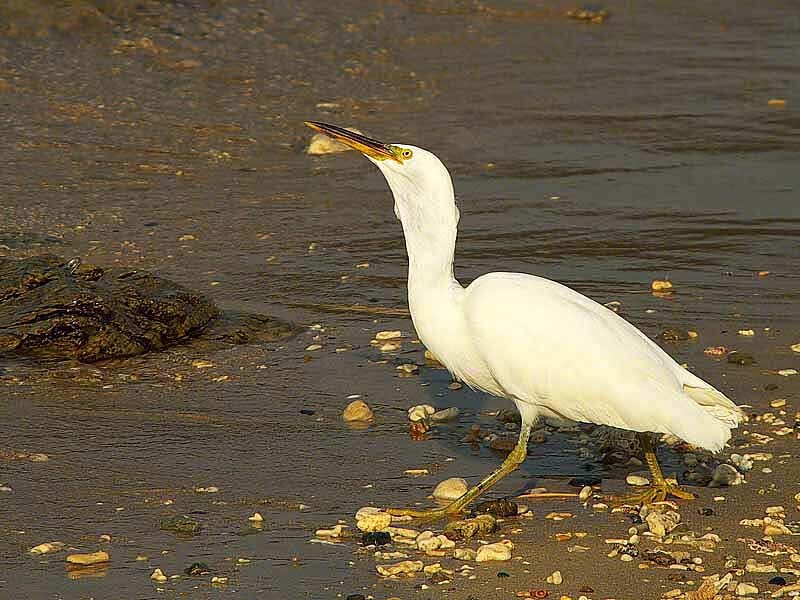 It is sometimes called a Sea Hawk or Fish Eagle and it eats fish, fresh or salt water, most of the time. Don't believe any source that tells you the Osprey eats fish exclusively. They'll go after a rodent or snake for a snack when nothing else is available. I've seen it with my own eyes. Just before sunup one morning, I was walking my dogs along a costal highway. I was on the beach side of the road. A Japanese man was jogging across the street. 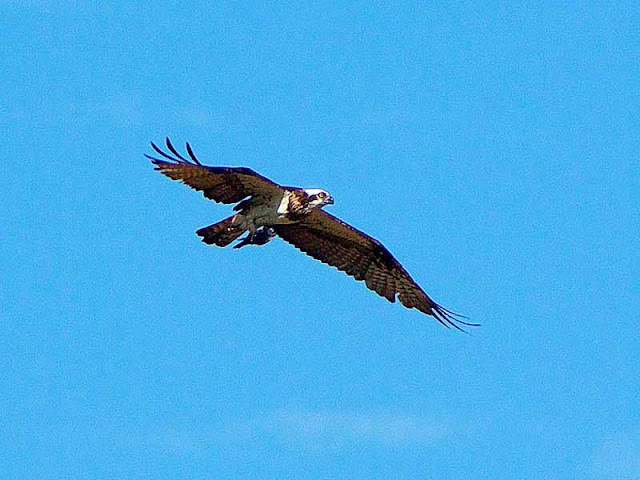 An Osprey, with a good 5-6 foot wingspan swooped down out of the sky to grab a shrew. 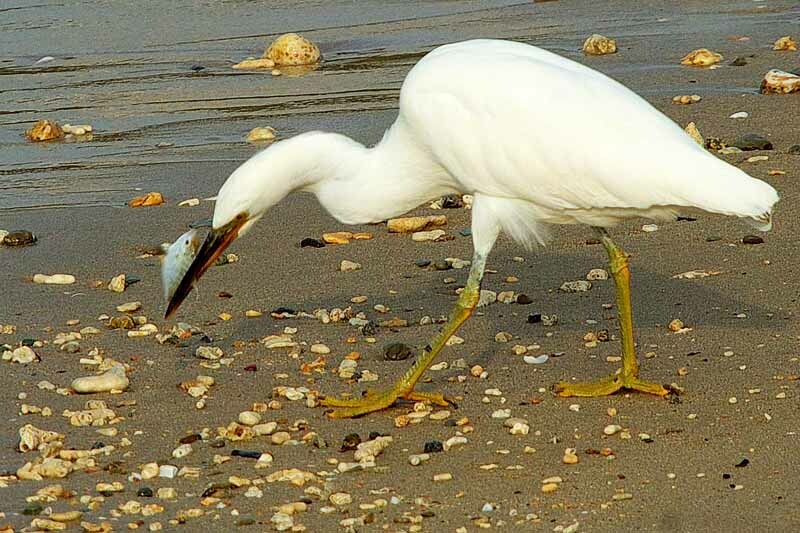 The runner didn't see the bird coming. The Osprey didn't see the runner. They collided and both got knocked on their fannies ! Are there any Ospreys in your neighborhood ? Watch them and learn. MORE OKINAWA WILDLIFE PHOTOS MAY BE SEEN HERE. Posting your photos on the social networks will get them noticed by friends and family. Maybe, hundreds of people will view them. What inspired this post was the photo I’ve posted above. I was looking for it in one of my galleries today (quite disorganized) and couldn’t find it. I knew it had been published recently at Apogee Photo so I went there to see if I had posted camera specs showing the date it had been taken. I was blown away by the number of views on the article. That particular photo, I never would have thought of submitting for publication. A writer and an editor selected it and if they hadn’t, it’d still be collecting digital dust somewhere! All five of these sites have published my work, some several times. Photography Tip for today: Visit these sites and get your photography published! 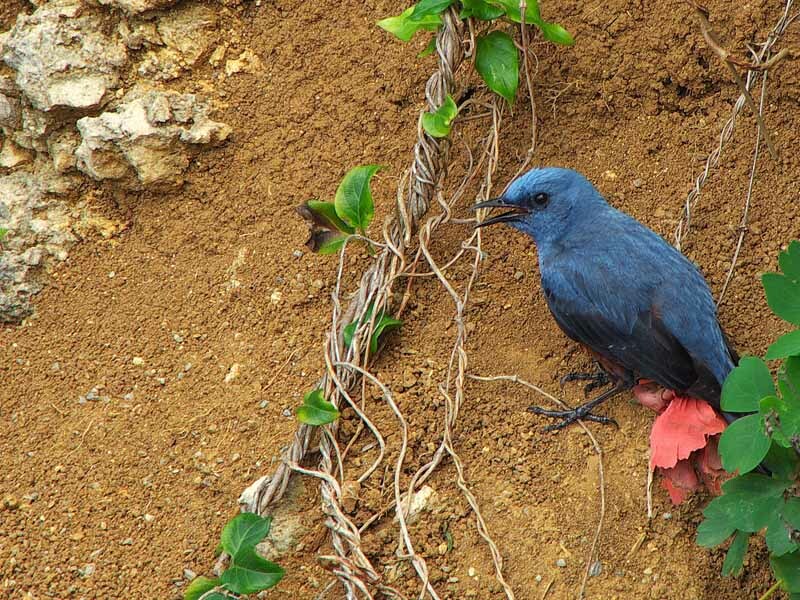 OK, Here she is, one of the Ugly Girls I took a picture of yesterday at Shuri Castle. I'm not trying to be cruel by calling her ugly. This is culture here. It's serious business. 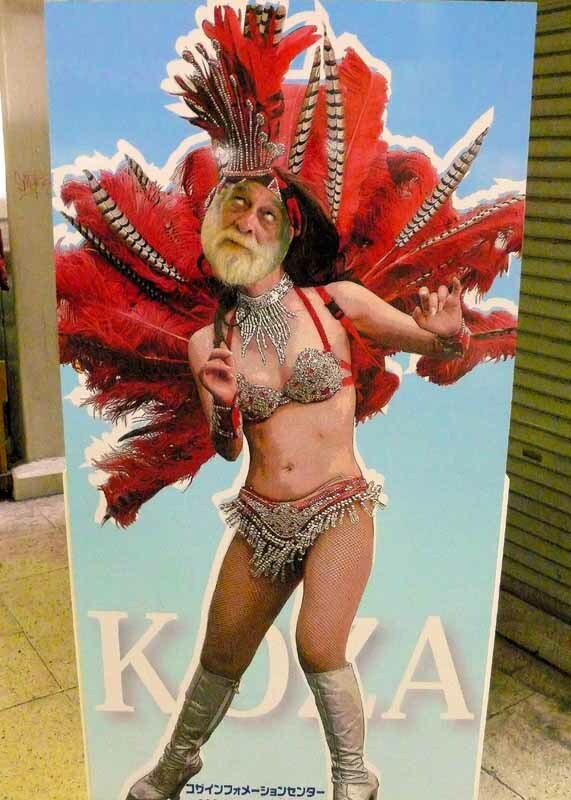 I'm learning all about Okinawa's Classic Dances and I'm doing it the hard way. Besides getting pictures of all the stuff, I'm even reading and asking people who know what they're talking about for some straight answers. "In classical dances, this is the only pair dance or uchikumi odori and the only dance in which masks are worn. This humorous story played by beautiful but cold-hearted women and unattractive but warm-hearted women influenced the future of Okinawan drama." Anyone who's been following this blog for more than a few days knows about the TROUBLE I got into when I got caught lying about Okinawan Dancers. So, now I'm real careful about what I say and verify everything to the nth degree. It looks like I'll be going to lots of dance classes before I'm an expert on all eleven of the classics. Don't worry, I won't be turning into a Twinkle Toes or anything like that. I'm not doing the dances, just taking pictures and getting the facts. 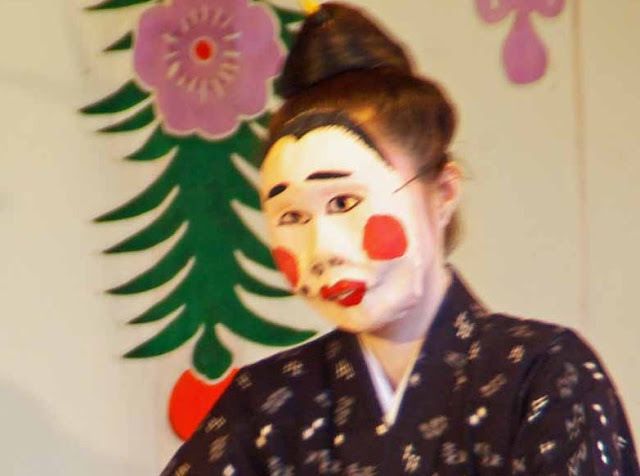 There are really no ugly girls in Okinawa, maybe, a few unattractive ones but, they're wearing masks. Have you got any Ugly Girls like Ugly Betty living in your neighborhood? Sunday Photo: Okinawan Dance with Pretty Girls and Some Ugly Ones, too. It started off being a real bad day today. I was heading to Shuri Castle for the second time in a week. Supposedly, I was going to take some shots of a friend's mother playing a Japanese harp. THE PRETTY OKINAWAN DANCERS SHOWED UP !!! Not wanting to bother her with asking for permission, I sorta tiptoed up a few stairs at a time. I watched to make sure she was concentrating on her work, her face wouldn't be visible and she wouldn't know I was sneaking closer and closer. 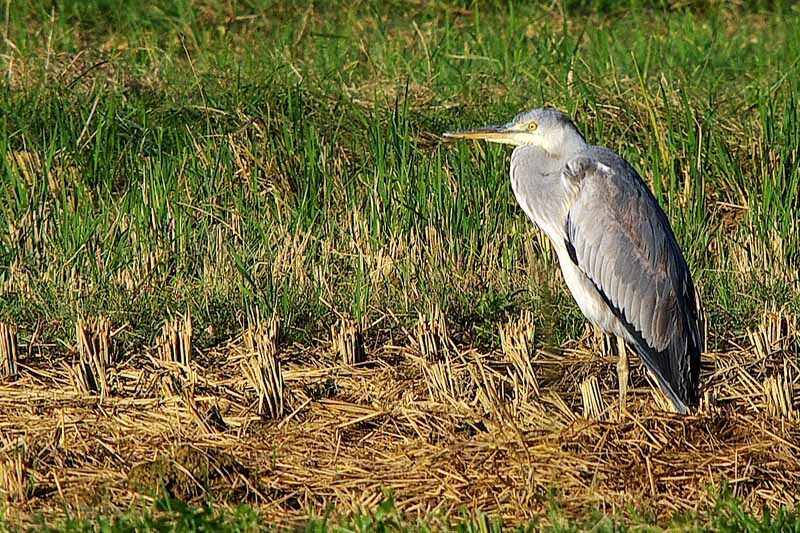 Each time I stopped, CLICK, CLICK, CLICK just as if I was trying to get a great shot of some exotic wildlife. That's how you do it, you sneak, aim, focus and click! The tool the lady is using for her maintenance is a hand sickle called a kama. 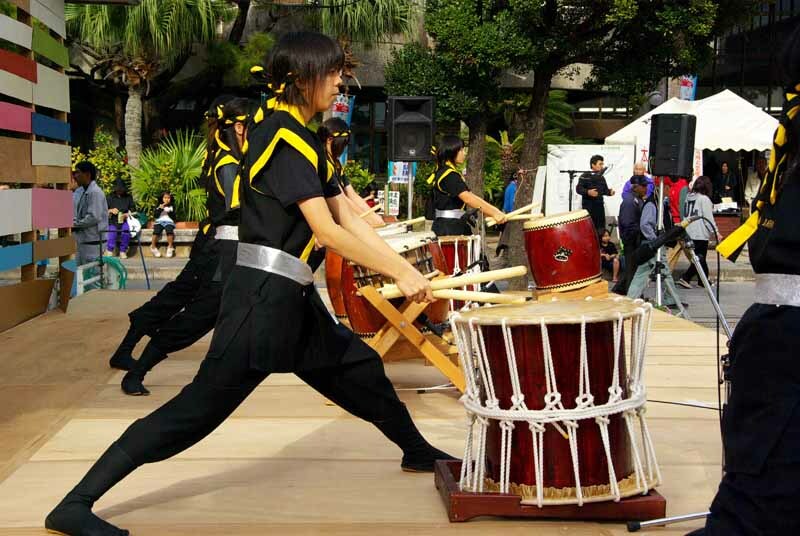 It is also a weapon used in the Okinawan Martial Arts. She is removing the vegetation sprouting between the stones of the castle walls. 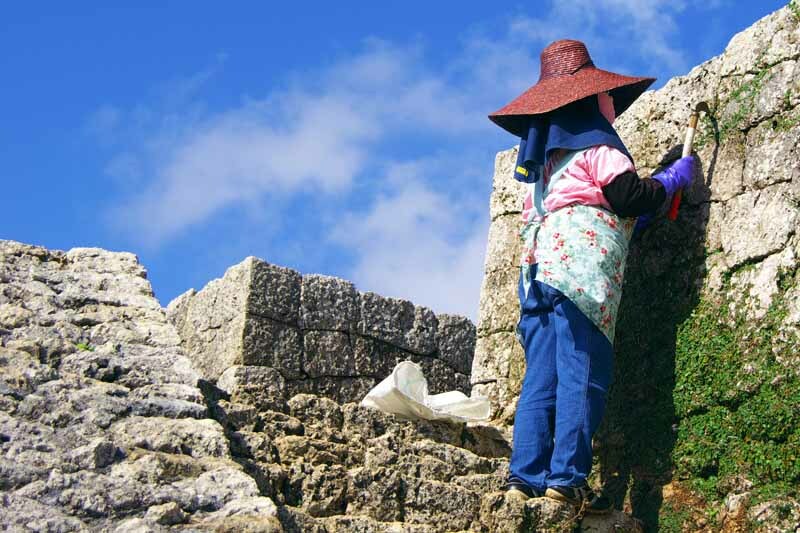 All the UNESCO Castles on Okinawa are constructed of stone but, they don't use mortar. The shape of the stones, their weight and gravity hold the walls in place. Here’s a series of ten photos taken at Manzamo, a tourist attraction on the cliffs along the west coast of Okinawa, Japan. 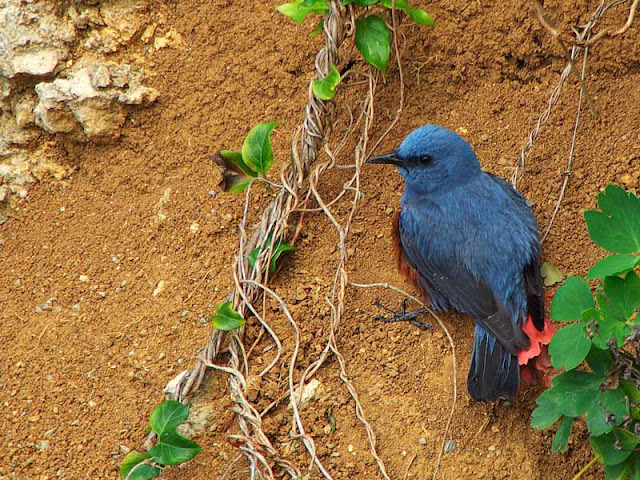 This Blue Rock Thrush (Monticola solitarius) was doing something I had never this type of bird do. So, I hopped the fence that keeps people from falling off the cliffs to see how much I could capture on camera before he flew away. Take a look at these photos and argue with me if you don't think he was preparing for a date. He started off preening his feathers while perched on some coral and limestone rocks. I took a few shots of that but, I’m saving them for a “Not-so-breaking-news-day”, if you know what I mean. 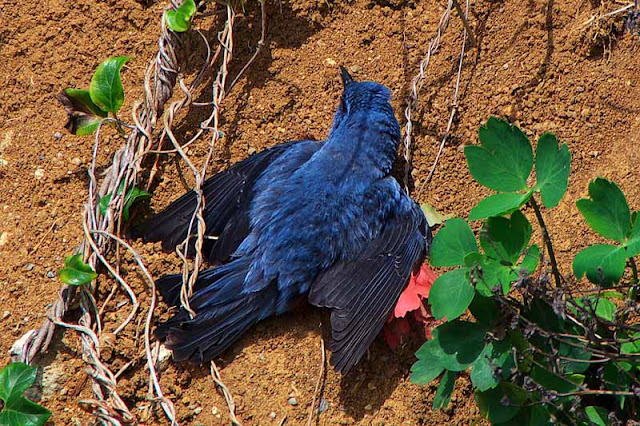 From his perch on the coral he flew to a patch of exposed clay and wallowed in the stuff, giving himself a dirt bath. He found the only plant in sight that had a red flower on it and snuggled and wallowed on it, too. He shaked it to the left. Then, he posed like he was listening to something. So, I shot him. Then he started chirping real loud. Then, he looked around. 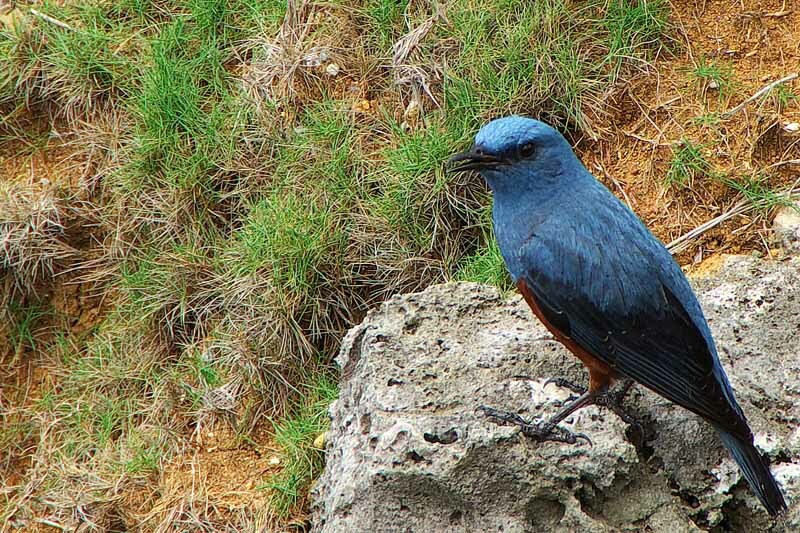 Chirped and looked around some more. 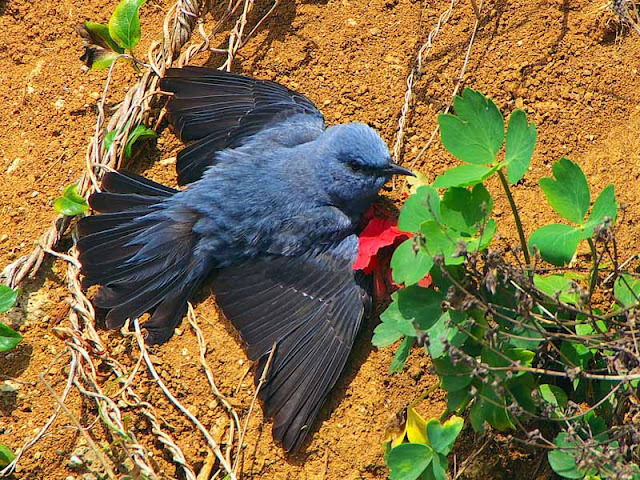 He flew back to his original perch on the rocks and shook the dust off his body one last time. 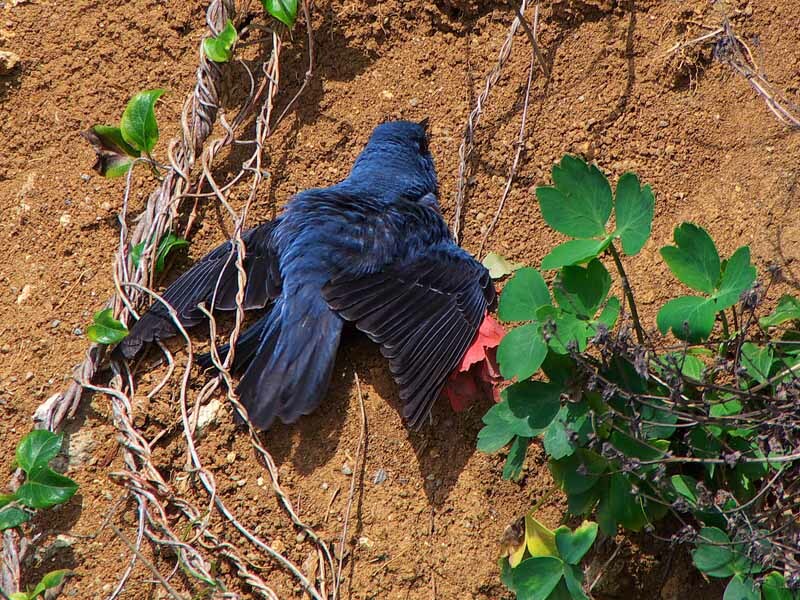 Then, he flew off to The Elephants Nose. I'm pretty sure there was a female Blue Rock Thrush waiting for him to finish his date preparations over there. What's the Elephants Nose? It's the name of another tourist attraction. 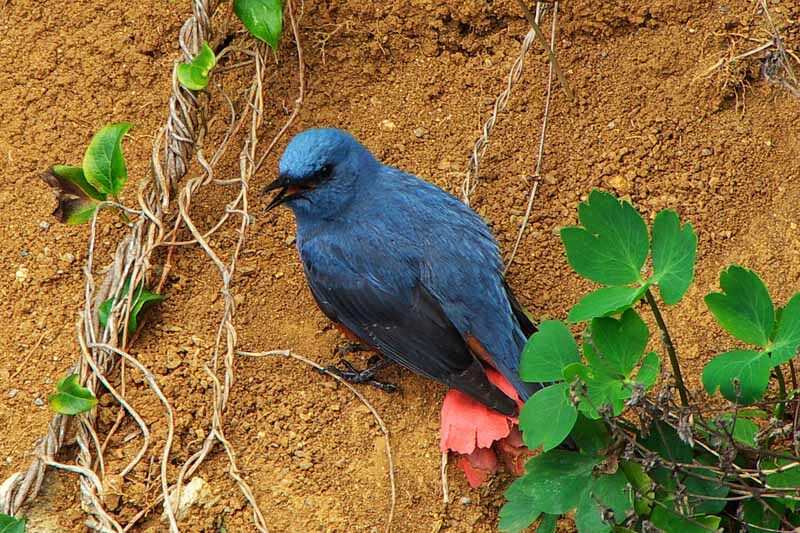 Not wanting to detract from my Blue Rock Thrush Preps for a Date Story I have to do a post on that some other time. Guinness Tug-O-War Rope: Editor's Pick-Twice!